140 mm/50 3rd Year Type5 х 1 pcs. 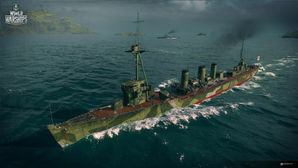 Iwaki Alpha — Japanese promo premium Tier IV cruiser. An advanced design of the Tenryu-class cruiser. The ship's displacement exceeded that of her predecessor, which allowed for a reinforced artillery armament and more powerful propulsion. At the project design stage, the cruiser was faster than all existing cruisers and many destroyers. Iwaki Alpha was given as a gift to any Alpha tester or Beta Weekend player at the beginning of the Closed Beta Test who played at least 100 matches during Alpha. Iwaki Alpha is best treated as a destroyer that is the size of a cruiser. With its light armor and good maneuverability this ship can wolf pack it with the best of them. When played like a destroyer this ship does wonders, and the 140mm guns gives this ship better guns than any destroyer in Tier IV. The biggest drawback to this ship is its cruiser sized hull with an appropriately-sized citadel section; this makes her an easier target for enemy gunners. Captains should take advantage of the ship's maneuverability to zig-zag into torpedo range. Similar to Arkansas Beta, Iwaki Alpha has access to upgrade slots that other ships of her tier do not: namely Upgrade Slot 2 and Upgrade Slot 5. Aiming Systems Modification 0 ensures greater accuracy and faster turret traverse. Equipped with the smoke screen consumable. Changes to matchmaker mean that she will see no more than Tier V ships on the enemy team. Has access to four upgrade module slots (compared to Kuma’s two). Equipped with a permanent camo. Prone to citadel hits and incapacitation of modules. Only five main guns compared to Kuma’s seven. Short-range anti-aircraft guns (3.1 km). As a premium ship, Iwaki Alpha doesn't have any upgrades to research. Slot 1: Aiming Systems Modification 0 ( ) greatly improves the accuracy of the main battery. Slot 2: Propulsion Modification 1 ( ) keeps the engine running. Slot 3: Aiming Systems Modification 1 ( ) improves the accuracy of the guns even further. Slot 4: Steering Gears Modification 2 ( ) improves the rudder shift for more dodging. Iwaki Alpha has access to Aiming Systems 0 and this upgrade should always be taken in Upgrade Slot 1. Combined with Aiming Systems Modification 1 in Upgrade Slot 3, Iwaki Alpha becomes the most accurate ship in the game. Propulsion Modification 1 in Upgrade Slot 2 and either Propulsion Modification 2 or Steering Gears Modification 2 in Upgrade Slot 4 are recommended. Spending credits or doubloons to equip Smoke Generator II ( ) and Hydroacoustic Search II ( ) are recommended for the reduced cooldown on each consumable. As a premium ship, Iwaki Alpha comes included with Type 9 camouflage that lowers her detection radius, reduces the accuracy of incoming shells, and increases the amount of experience she earns. Iwaki Alpha is reasonably fast, so Sierra Mike ( ) may be useful to the player. Victor Lima ( ) and India X-Ray ( ) may be used to increase the fire chance of main battery high explosive ammunition by 1%. Juliet Whiskey Unaone ( ) will increase torpedo efficiency by increasing the chance to cause flooding. Iwaki (岩木, named after the Iwaki River) is based of the "Tenryu-Kai" project, a planned series of six long range light reconnaissance cruisers that were based off of the Tenryu-class. These ships were essentially repeats of the previous Tenryu-class as the only major difference was the installation of an additional 140mm gun. The class was cancelled in 1917 after the Japanese learned the details of the American Omaha-class and realized the inferiority of the "Tenryu-Kai" project. The larger and more heavily armed Kuma-class were built in their place. The project was given the name "Iwaki" by Wargaming in accordance with the Imperial Japanese tradition to name light cruisers after rivers. Designed in 1916, but its Type 96 25 mm anti-aircraft guns did not begin developmet until 1935. The triple mount version only entered service in 1941. This page was last modified on 29 June 2018, at 13:33.